Is it possible to talk about right and wrong in this world anymore? In our democratic society, is the majority always right? The first 5 books of the bible (AKA the Pentateuch) cover the origins of life and the origins of the nation of Israel – a priviledged nation because God Almighty chose them to be his people, in a promised land, with directions (commands) to obey and live in rest and peace. The book of Joshua described a great time of the nation entering the promised land and driving out all foreign nations lest they tempt them to stray from God’s plans. Then, in Judges, we read of a nation declining as they returned again and again to sin, rejected God as their king. While the nation should have strived by loving the Lord with all their heart and neighbour as themselves, the problem of sin continues to blossom in the bible narratives. Then we get to the books of 1 and 2 Samuel. Israel demands of Samuel that they have a king just like the other nations. By the word of the LORD Samuel consents to the people’s wicked request. While having a king was not a sin, the real error is that they were rejecting God once again. The first king of Israel, God’s anointed one, was Saul with his son Jonathan as the prince of Israel. The book of 1 Samuel describes how this came to be and how king Saul disobeyed God and so God found another man, a man after His own heart, to be the next king. David, the son of Jesse, the great grandson of Ruth and Obed, was anointed by Samuel as the king of Israel. David was pursued by the jealous king Saul but befriended by Saul’s son, Jonothan. 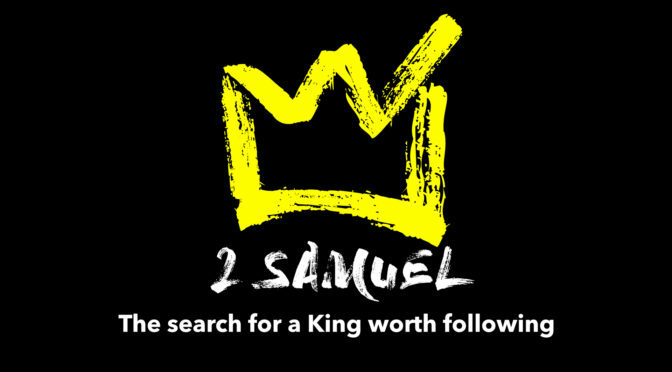 Finally, in the first chapter of 2 Samuel, David receives word from a foreigner that king Saul has been killed. The messenger reports that he killed a dying Saul. Rather than rejoicing, David demands the life of this man for killing the LORD’s anointed. The fact that Saul gave David a really hard time in his life does not change the fact that Saul was anointed by God to be king. David demonstrates his love for God and His kingdom more than the kingdom of David. The lament that he teaches all the people to recite shadows the lament of those who would look on the ultimate King of the Jews slain. Good Friday is a day to reflect on our sins as we humans slay The Anointed One. 15 So they stood up and were counted off—twelve men for Benjamin and Ish-Bosheth son of Saul, and twelve for David. 16 Then each man grabbed his opponent by the head and thrust his dagger into his opponent’s side, and they fell down together. So that place in Gibeon was called Helkath Hazzurim. 29 All that night Abner and his men marched through the Arabah. They crossed the Jordan, continued through the morning hours and came to Mahanaim. 2 Sons were born to David in Hebron: His firstborn was Amnon the son of Ahinoam of Jezreel; 3 his second, Kileab the son of Abigail the widow of Nabal of Carmel; the third, Absalom the son of Maakah daughter of Talmai king of Geshur; 4 the fourth, Adonijah the son of Haggith; the fifth, Shephatiah the son of Abital; 5 and the sixth, Ithream the son of David’s wife Eglah. These were born to David in Hebron. The structure of a narrative can be broken down into the 5 basic elements of any story: Beginning, Problem, Quest, Resolution, End. See this post from the book of Jonah to see how this works. We’ll step through the five stages of this narrative to discover what we are supposed to notice. “…David inquired of the LORD…” The story begins with David having waited a respectable time since the death of Saul. He is not eager or ambishish to take the kingdom of Israel before it is time. After a time, he asks of Yahweh if he should go up to the region of Judah. David appears as the good guy in this story, acting nobly as a propper king of Israel. This inquiry is not a small mention at the beginning of this story. Just as God went before Moses and Joshua and the judges of Israel, David is shown to be a man of God. Notice the slow pace of Verse 1 and then the deliberate and complete obedience of Verse 2 as David goes all in. “…the men of Judah came to Hebron, and there they anointed David king over the tribe of Judah.” I have placed a table below on all of the people and place names for a quick reference. The LORD sent David to Hebron. He is welcomed there and enthroned as king over Judah – one of the 12 regions of Israel. Judah is the region David came from (in Bethlehem) and it is prophesied as the kingly line of Israel (Genesis 49:8-10). David is to be God’s anointed king of Israel. “…I too will show you the same favour…” David approaches Jabesh Gilead, a region of Saul followers, and proposes a peace. We are not told what the people of Jabesh Gilead say in reply – presumably it is a positive one – but the absence of an answer leads us to ask the question of this passage: will everyone submit to king David as God has ordained it? “Meanwhile, Abner…made [Ish-Bosheth son of Saul] king over … all Israel.” So, there’s the problem. While David and Judah and the LORD are on the same page, the rest of Israel are not. From this point on, the story is driven by the men of Ish-Bosheth and the men of David and not by David or Ish-Bosheth (IB) themselves. This is a question of who the people will follow. IB is silent in this whole process and the rebellion is driven by Abner, the son of Ner who was Saul’s uncle (1 Samuel 14:50). Benjamin was Saul’s native people. “The tribe of Judah, however, remained loyal to David.” The problem is laid out for us. It is another David v Goliath battle. David and his relatives in Judah against IB and his relative in Benjamin and the rest of Israel. “…men of IB…and…David’s men went out and met…at the pool of Gibeon. One group sat down on one side of the pool and one group on the other side.” There is a face-off sounding similar to the confrontations between Israel and the Philistine enemy. This, though, is civil war. “Let’s have some of the young men get up and fight hand to hand in front of us.” Abner asks this of Joab and his response is, “All right, let them do it.” Again, I’m reminded of the battle between Israel and the Philistines where Goliath came down to represent Philistine against a representative of Israel. The united Israel won that day as David stepped up to represent the people of God. This time we have the brothers of Israel facing each other. “Then each man grabbed his opponent by the head and thrust his dagger into his opponent’s side, and they fell down together.” Twelve men of IB faced up against twelve men of David. Though the country is divided, they all fall down this day together. Twenty four men died. Do we make much of the number 12? We ought to pause and reflect that Israel contains 12 tribes who are later represented by the 12 disciples. We won’t go too crazy over numbers in the bible but 12 appears to be a complete number. “The battle that day was very fierce, and Abner and the Israelites were defeated by David’s men.” After the twenty four men fell by the dagger, the rest of the men present that day fought each other. David’s men, against the rest of Israel, were victorious. “Now Asahel was as fleet-footed as a wild gazelle.” What a cool verse! Abner survived the battle and we now learn of Asahel and his brothers. Asahel goes in hot pursuit of Abner. “…turning neither to the right nor to the left as he pursued him.” Asahel was determined and concentrated on the man, Abner. He might have stopped and slain people this way or that but he ran past them and fixed his eyes on Abner. This man, above all others, has instigated a rival to the anointed king of Israel. “Stop chasing me! Why should I strike you down? How could I look your brother Joab in the face?” We are reminded that this is civil war. Much death has occured on this day but Abner does not want to kill the brother of Joab. “Asahel…fell there and died on the spot. And every man stopped when he came to the place where Asahel had fallen and died.” Asahel had been miles ahead of his comrades since he was ‘as fleet-footed as a wild gazelle.’ When they had caught up to him they found him killed. “But Joab and Abishai pursued Abner…” Two men continued the pursuit. They had not been as fast as Asahel but they were as determined to end this. “Then the men of Benjamin rallied behind Abner. They formed themselves into a group and took their stand on top of a hill.” We get ready for another round of fighting. Only Joab and Abishai are there to face up against the men of Benjamin. It could easily turn into a slaughter of the leaders of David’s men. “How long before you order your men to stop pursuing their fellow Israelites?” It’s odd to find Abner as the one to call a truce. But Abner, who is leading most of Israel (on a defeated day) sees that the men of David are driven. They will not stop until this is over. Abner has shown remorse in killing Asahel. He seems to not want to see any further bloodshed today. We are reminded again that this is a civil war. “As surely as God lives, if you had not spoken, the men would have continued pursuing them until morning.” Joab agrees that David’s men would not have stopped. The issue in this story has taken a strange twist. It was initially about who the people in Israel would submit to. Now the issue has become about how far will the people of God go in destroying each other. Will the kingdom of David be overcome by bloodshed? Will his kingdom be defined by being the stronger army? “So Joab blew the trumpet, and all the troops came to a halt…” And as the sun was setting (Verse 24) the battle stops suddenly. The pursuit is over. The challenge is paused. Everyone is ready to go back to their homes. “…marched through the Arabah….came to Mahanaim.” Abner and the men of IB travelled back home to where IB reigned. The Arabah is south of the Salt Sea which is the Dead Sea and which was known as the Arabah Sea. “Then Joab and his men marched all night and arrived at Hebron by daybreak.” David’s men made their way back to David by the next day. The comment in Verse 32 about Asahel’s burial need not have been fulfilled that night. “The way between the house of Saul and the house of David lasted a long time.” These 5 verses do not drive the story further at this point and so we come to the end of this account. David’s house grows increasingly stronger and Saul’s house grows increasingly weaker. David’s house is described during his reign in Hebron. Later in this book we will hear of how David came to live in Jerusalem. The narrative begins and ends with David, the anointed king of Israel. He is God’s king, walking in obedience to God and God blesses and establishes his kingdom. The enemy of David’s house, Abner, puts a false king on the throne and instigates a civil war among the people of God. He does not succeed but the people of God were struck with a death toll. While God is sovereign and his promised king is clear, the way of the kingdom contains battles and resistance. The King of the Kingdom has His enemies who will try to shake it. Topic A: The true King verses the world. The world we live in has the choice of submitting to the Anointed King Jesus or establishing a kingdom of their own. Even as the people of God, Christians are confronted every day with temptations to bow to other rulers: money, self-gain, popularity etc. King Jesus reigns in truth over a world that denies his rule. Topic B: Turning neither to the right nor to the left. The episode of Asahel pursuing Abner with his gazelle-like legs leads us to consider our determination to run straight and true in the Kingdom of God. While this application appears allegorical at first (which is a reading method that comes with great caution) it appears amidst a greater story establishing David as king and yet people have looked elsewhere for an alternative. The enemies of the Kingdom of God are our enemy. We don’t consider people as the enemy, rather we consider the lies of the devil and of this world as the enemy. The New Testament teaches Christians to put to death the misdeeds of the body. Topic C: An unfinished war. While the men of David won the battle that day, the war was not over. Jesus is the established king of the kingdom and his subjects continue to grow over time and across the world. We live in this time of an unfinished war. We don’t fight with swords or spears or daggers, but we speak the truth that Jesus is Lord of all. We won’t win this battle by strength or wit but by faith – simply knowing that the King we serve IS the King. Plain and simple. People David’s wives: Ahinoam of Jezreel; Abigail the widow of Nabal of Carmel. Zeruiah, of Bethlehem (deceased), father of Joab, Abishai and Asahel. Abner son of Ner, the commander of Saul’s army. Jabesh Gilead(?) Jabesh Gilead – Saul had fought for them in 1 Samuel 11 and they took care of Saul’s body in 1 Samuel 31. Mahanaim – where Ish-Bosheth reigned. Gilead, Ashuri, Jezreel, Ephraim, Benjamin. Gibeon – in the Benjamin region. Renamed Helkath Hazzurim meaning field of daggers.